The Firefly: The Game – Esmeralda Coachworks game booster adds a new Series IV Firefly to Firefly: The Game. 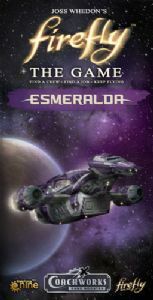 Based on the Series IV Firefly Chassis, the Esmeralda is the perfect ship for discreetly carrying people who don't want to be found to places they won't be followed. A Coachworks game booster contains everything players need to add a new ship to Firefly: The Game. 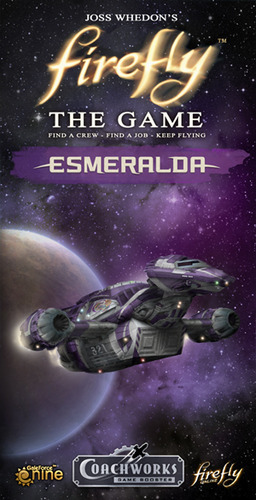 The Esmeralda set contains a new Firefly Series IV model (purple); ship card; color-coordinated ship dice (purple); a drive core card; new ship upgrades; sheet of game tokens; a new Set Up Card; and a new Story Card. The Firefly: The Game – Jetwash Coachworks game booster adds a new Series IV Firefly to Firefly: The Game.